For the first time in history, the Chinese did not win the Asian Games Mixed Doubles title. Defending champions Wang Nan/Wang Liqin lost in the semifinals to the Hong Kong pair Cheung Yuk/Tie Yana, while Ma Lin/Li Nan was beaten by the S. Korea pair Ryu Seung Min/Ryu Ji Hae. The Chinese thought of the mixed-doubles title as the second easiest table-tennis title of the Asian Games, after the women's team title. Unexpectedly, the Chinese did not even win the silver. On the adjacent table, Ma Lin/Li Nan lost to the host team Ryu Seung Min/Ryu Ji Hae 2-4 (-9, 6, -5, -6, 14, -3). The Chinese made too many errors in the semifinals and did not play up to their normal levels. The Hong Kong pair Cheung/Tie attacked powerfully and had great speed. The two Ryu's played with great spirit and they were the better team. Afterwards Cai commented that the Hong Kong pair played well. Cheung Yuk was a great threat on offense, and Tie was good with controls. It was not easy for the Wang/Wang pair to pull ahead after being 0-2 down. He also said that Wang Nan was still adjusting her conditions, and the pair did not play well together. He believed that Wang/Wang was strong enough to win, but was not that much better than the opponents. They did not prepare well enough, and was playing a little tight. Wang Nan's problem was that she lacked confidence, and was not decisive in the match. The finals between Hong Kong and S. Korea was an exciting match. Ryu/Ryu played some critical points better in games 1 and 3 to go on top 3-0. Then they seemed to have relaxed a bit, and the Hong Kong pair caught up to 2-3. The 6th game was the critical one: HKG was up 10-5, but KOR scored the next 6 points to have match-point at 11-10. With the partisan crowd roaring its approval, Cheung Yuk raced to his far left to hit a great loop to save the match. At 11-12, Cheung hit a high arcing loop to Ryu's forehand to force an error, saving the second match point. Then a couple of mistakes by the Koreans gave HKG the game. Match now tied at 3-3. The 7th game was almost an anti-climax. HKG picked up an easy 11-3 game for the match and the title. The Korean pair looked deflated in the last game, while Tie was hitting winner after winner with her backhand. After the match, the Hong Kong coach Li Huifun said that she was under tremendous pressure after her team beat Wang Nan and Wang Liqin. "We did not want to beat China, and give the gold medal to the Koreans", she said. Two Chinese pairs and two S. Korean pairs made the semifinals. Wang Nan, still not playing to her ability, and Guo Yan lost to Lee Eun Sil/Seok Eun Mi 1-4 (8, -8, 10, -9, -8, -4). In the other semifinal, Zhang Yining and Li Nan beat Ryu Ji Jae and Kim Moo Kyo 4-1(7, 6, -8, 8) to advance. The final match was exciting. Zhang and Li played superbly to go ahead 2-0. Then the Koreans won the 3rd game to stay close. Zhang/Li won the 4th to go ahead 3-1, and it seemed that China would get its 2nd gold. However, the Koreans, helped by the crowd, fought back by winning the next 2 to tie the match up. The last game was a nail-biter. Zhang/Li had match point at 10-9, but failed to convert. Finally, a slight indecision by the Chinese cost them the match: 10-12 and 3-4 to S. Korea. The two Chinese pairs faced Korean opponents in the semifinals and were convincingly beaten. Kong/Ma faced Lee Chul Seung/Ryu Seung Min and went down 1-4 (-6, -5, 5, -4, -8). Afterwards Kong said that he and Ma had strategic problems, and their shot placements were not right. They did not have control. This was the first time Kong and Ma played in a major tournament, and they had difficulties playing as a team. Wang's racket was damaged during the match against Oh/Kim. After the match, Wang said that they had not prepared sufficiently, and also had not expected that Kim and Oh would play so well. They did not have confidence when they fell behind. Wang Liqin and Yan Sen lost to Oh Sang Eun and Kim Taek Soo 0-4 (-8, -6, -10, -6). Korean coach Yoo Nam Kyu said that the whole Chinese team was going downhill in this tournament, and that the Chinese were not as strong as before. "Since everyone expected the Chinese to win, they had tremendous pressure", Yoo said. "We expected that one of our pairs would have a chance to win, and were surprised that both won". In the finals, Lee/Ryu upset Kim/Oh 4-3 (7, -3, 9, -5, 7, -3, 11). Since Ryu won a gold medal in the Asian Games, he is now excused from military duty. He avoids the interruption that Oh Sang Eun had. "I somehow ended up as Ryu's coach this past March", Yoo Nam Kyu said. " I told him 'You want to serve military duty? If not you have to work your hardest to get an Asian Games gold medal. Otherwise you will always be a second-tier player'". 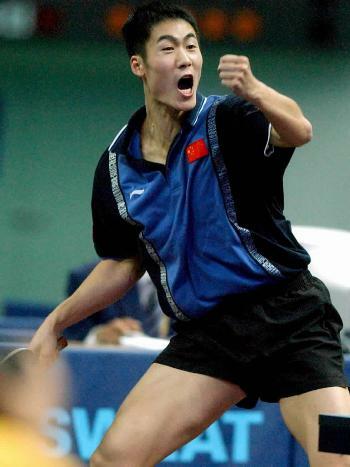 In the quarter-finals, World Cup champion Zhang Yining had a scare. She fell behind Japan's Aya Umerura 0-3, before fighting back to win the last 4 games (-9, -9, -5, 8, 9, 12, 7). Li Jia Wei of Singapore won a tough 7 game match against Hong Kong's Tie Yana, while S. Korea's Ryu Ji Hae beat Hong Kong's Lau Sui Fei 4-1. Wang Nan met Kim Hyon Hui, the N. Korean player who beat her in the decisive 4th match of the women's team final. Wang had no problem at all with Kim, easily winning in 4 (4, 11, 5, 6). In the semifinals, the Chinese regained their lost forms by easily beating the opponents 4-0. Wang Nan faced Li Jia Wei who had given her trouble in the teams tie, and had no difficulty this time. Zhang clearly outclassed the struggling Ryu Ji Hae in the other semifinal. The finals pitted Zhang against Wang Nan. The two top women in the world played a close exciting match, with Zhang finally winning the 7th game 11-9. This is the first major victory for Zhang over her nemesis Wang, and may be a sign of the power shift at the top. "The gold medal is of course important, but it is not the most important thing for me", Wang told reporters after the match. "In women's teams, mixed doubles and women's doubles I suffered losses. For me to be able to play in the finals of the women's singles is somewhat of a breakthrough for me". Even though the consecutive losses are still fresh in her memory, Wang is able to face that "very painful, indescribable journey" now. She does not feel that the coaches should bear the responsibilities. "We were all trained and prepared. We lost because we did not have control of our emotions when we were behind. No one else could help us", Wang said. She did not think that her injuries and the 11-point scoring were the reasons why she did not perform well. She felt that her biggest problems were mental, and that she beat herself. "Although I was prepared for the difficulties of the matches, but due to my excellent results the last few years, I was not really ready. I did not study my opponents well enough, and when I realized that the opponents have some new skills and tactics, I was affected mentally and not able to play at my own level". Wang has been ranked number one since 1997. "After the Sydney Olympics, I felt that I could lose anytime. But then I won the Worlds and other major titles, and I started to think that there are not too many difficulties ahead for me. When at the top, we usually don't know where we really need to do", Wang said. "The Asian Games are a clear warning to me. Now I know where I stand. There are excellent players in the world, besides myself. I will summarize my experiences well when we get home". "Since the new rules were put in effect, the training had been more difficult. Besides my back injury, I also have injuries in my wrist and leg. I need to recuperate when I go back", Wang said. In the quarters, Wang Liqin beat Ko Lai Chak (HKG) and Kong beat Cheung Yuk (HKG) by the same 4-0 scores to advance. Chiang Peng-Lung lost to Oh Sang Eun 1-4 to finish his disappointing trip to the Asian Games. In the last quarters, Chuan Chi-Yuan staged a minor upset to overcome defending champion 4-3 (-7, 8, -8, -6, 9, 5, 6). Chiang has been playing very poorly at the Asian Games. His coach said that Chiang is suffering from a severe spinal injury, and that Chiang could hardly stand up at the end of a match. He lacked power on his forehand, and could not move quickly. Because Chiang has been playing so much in Japan, he has not had a chance to seek proper treatment. Chiang will need serious treatment when he goes back to Taiwan after the tournament. It is worth noting that Kong has been playing inconsistently. He had a tough 7 game match against Koji Matsushita the previous round. Normally Kong has no trouble with choppers. Oh is another player who has been struggling. He barely got by Japan's Toshio Tasaki 4-3 (11-9 in game 7) the previous round. Kim Taek Soo also has not been playing well, and Ryu is actually the more consistent Korean player in the recent past. In the first semifinal, the 21-year-old Chuan blitzed Kong 4-0 (6, 15, 4, 4) to score one of the major upsets of the event. The very quick Chuan totally dominated the control-oriented Kong, demonstrating that speed once more is a deadly weapon. Chuan trained with the Chinese 2nd national team when he was 13 years old, and for a long time was using Chinese rubber, according to the TV commentators. In 1999, Chuan started playing in Germany, and learned how to beat the European styles. He is already the top player in Taiwan, and will be a major opponent of the Chinese for a long time. In the other semifinal Wang Liqin picked up a straight-forward victory over Oh Sang Eun 4-1 (6, -9, 8, 5, 6). Wang was clearly in control and appeared to be in top form. The final pitted up-and-coming Chuan vs the world-number-one Wang. Wang fell behind 1-3 in game 1, and then scored a flurry of points to win it 11-4. In game 2, Chuan opened with a 7-0 lead. Then Wang went on a patented run, and tied at 10-all. The game was tight, but Wang eventually won 12-10 due to much better execution at critical points. In game 3, Wang again fell behind 4-8 and 6-9, and came back to win 13-11. In game 4, he was behind 2-6, and won at 11-7 for the game, match, and championship. Wang clearly showed an ability to focus when the game is on the line. He is much more mature now, and seems to be able to execute at a higher level at the end of games. He still has occasional lapses, but seems to be able to recover just in time. Chuan, on the other hand, plays well in the beginning of the games, but when his speed cannot consistently win points for him, he does not have a "plan B". He needs to develop an ability to vary his tactics, and play for control, instead of betting everything on pure quickness. "Many people asked me what are the effects of the rule changes. Of course, everyone is affected, but we all know that the 11-point scoring and the service rule change are aimed at us. Because we are too strong. If we change to 1-point scoring, then anyone can win. "Our women team did not play well. It has been difficult. We had great results, so it was hard for our players not to be complacent and take things too lightly. We were finally able to step out of the shadow (in WS), and that is a good thing. "We learned a lot from men's doubles. The Koreans are now ahead of us in techniques and tactics. This has waken us up. We are getting better, but the Koreans are improving faster. For the Olympics, the MD event is one that we will focus greatly on. "The DPK team is a strong team. They have fine techniques, and only lacked big-game experiences. They will be a big threat to us. But basically we did not prepare well this time. "The Asian Games has been a very painful experience for us. I think the Chinese team has entered one of the most difficult phases of our recent history." Cai said.